Ok, it’s not really a harvest. 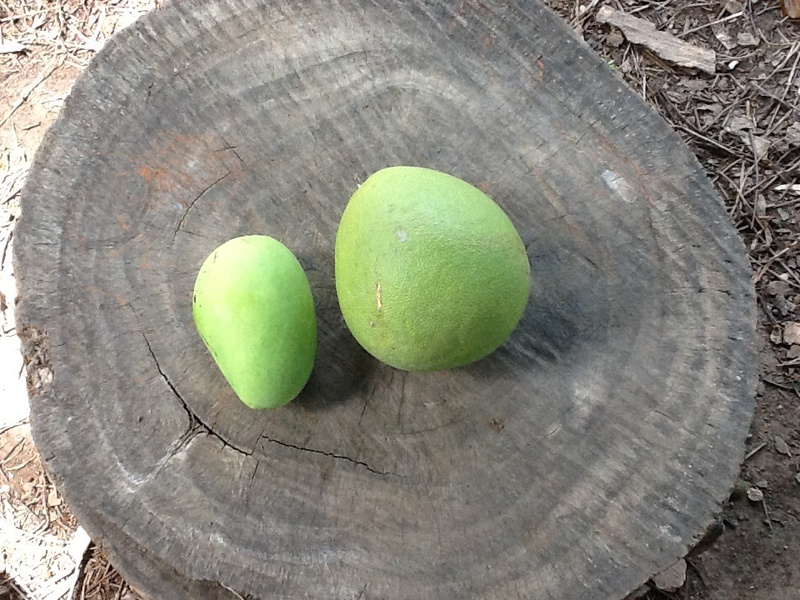 I passed by my predominantly carabao mango orchard today and saw a lone mango so I plucked it from the tree. It was still green but if I didn’t do it, someone else will harvest it! At the far end of the orchard, I have 5 pomelo trees which I don’t really pay much attention to. The pomelo produce isn’t commercial; not too sweet nor juicy. Ok for salads per my thinking. I’m not really a pomelo eater but I also got to pluck out one to try. It was fortunate that I was able to get one because a lot of people pass thru the farm and pluck illegally when no one is looking. Anyway, I’m excited to make some green mango salad which is basically green mango, bagoong or shrimp paste and tomatoes. For the pomelo, buy some lettuce , ham, cheese with some Asian dressing. Hmmm…I’m getting hungry just thinking about it. Bon Appetit! 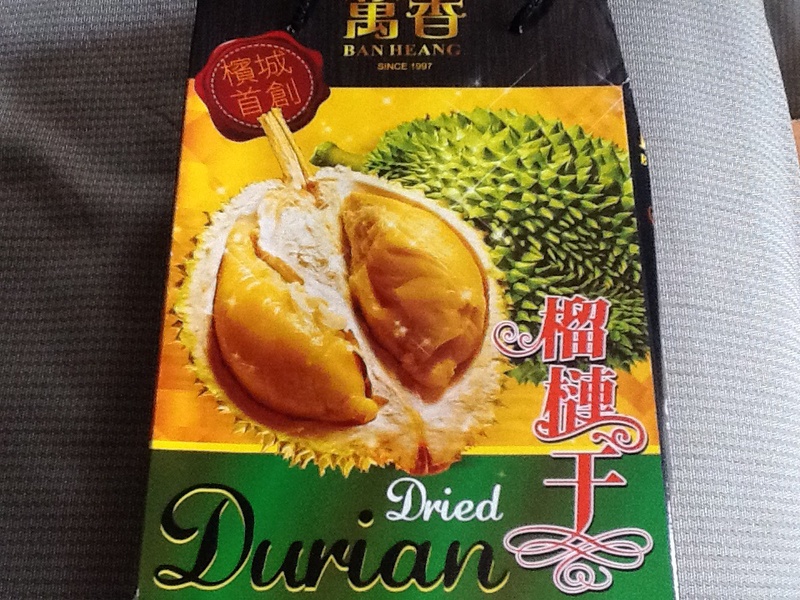 A friend of mine who visited Malaysia recently gave me a pack of dried durian to try. Since I was staying in a hotel, I didn’t want to open the pack even in my room because I feared the smell would spread all over the hotel. So I waited to bring it to Manila. My wife definitely hates the smell of durian so I have to eat it when she is out of the house. So one day my wife was out for a couple of hours and I had my chance to taste this product. I opened the carton and found out the dried fruit was vacuum-packed and resealable. The packaging says it is 100% durian, meaning it’s all fruit that was probably dried and sealed immediately. The dried fruit feels light, way different from the dried carabao mangoes I’m used to. When I put it in my mouth, it seemed to melt. Delicious! However, after a few more bites, the fruit seemed to get stuck in my gums. Eventually it melts but sometimes it’s a bother for me since I have sensitive gums. And there was no smell! You couldn’t smell that durian smell. Well, only my breath smelled and I thought it wasn’t too bad, but I had to be sure so I put the product to the test . . . of some sort. First, to mask the bad breath, I drank beer. Then I find out from friends not to mix beer and durian. I don’t really know why. My thinking is it has to do something with uric acid. Others say maybe I might get a bum stomach. My stomach is quite strong but it can’t take green mangoes and ice cream. Hehe. Anyway, before my wife arrived, I gargled with Scope and everything seemed A-OK. When she stepped out of the car, I went near her and asked her if she noticed anything. She looked up and down and shrugs curiously. So I asked her to kiss me. She gave me a peck. I asked her to kiss me again and asked if she noticed anything. She couldn’t tell. Success! Dried Durian passed the test! Like any other durian product, nothing beats eating the fruit. Grabbing the fleshy meat and savoring the taste is something to die for. As many people say, “Tastes lie heaven but it smells like hell!” Given a choice, I will always go for the fruit. But if that isn’t an option, the dried durian isn’t bad. Not bad at all. It’s Durian season in the Philippines. And the King of Fruits can affect one’s marriage. Really! This fruit tastes soooo good but smells sooo bad! I’m not allowed to eat this fruit in my Manila home because my wife can’t stand the smell. So I eat it with gusto when I go to Bacolod where I do my work. For many families, eating this fruit can be grounds for divorce. So they say. Many hotels don’t allow this fruit in their premises. The airlines want the passenger to package it well should they transport it. I abide with my wife’s wishes. But what if I use durian as a bargaining chip? 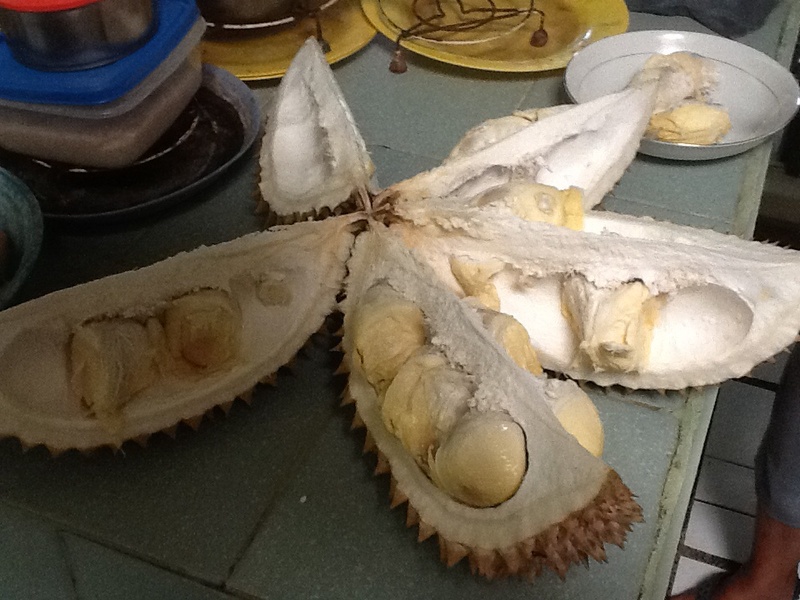 For every year that I not eat durian in Manila, my wife should get rid of five cats. Theoretically in six years we will have zero cats! 🙂 Sounds fair to me! I will do anything to lessen the number of animals in the house…ok nearly anything.